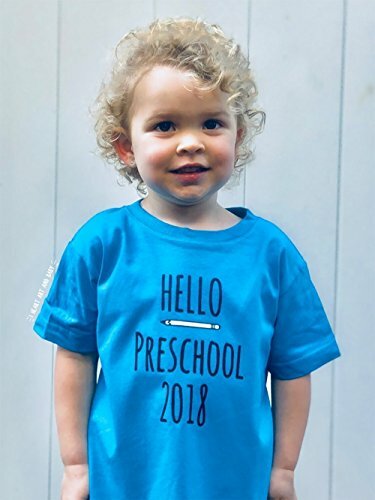 This "Hello Preschool 2018" shirt is the perfect top for this year's First Day of School! This shirt works great as a photo prop to help document the big day! Other sizes and colors are available via links below. Our unique design is professionally printed on soft, breathable cotton so your child will be stylish and COMFORTABLE heading to Preschool! As a size reference, the female child modeling here is 3 years old and wearing the 3T, the male is 5 years old and wearing size 5/6. - Machine Washable (Inside out, Gentle Cycle, Hang Dry). Personalized This little pumpkin is going to be a Big Sister! Pregnancy Announcement Shirt or Bodysuit - Can be Personalized with ANY Name! Star Wars BB8 Birthday Shirt, ADD any name & age, Happy Birthday Shirt, FAMILY Matching Shirts, BB8, Star Wars shirt, VISIT OUR SHOP! !